Esoteric School of Shamanism and Magic Blog: Online Magic: Which Magical Type are You? Online Magic: Which Magical Type are You? So which type are you? You might be a combination of two types, but usually one of the magical elements dominates your personality type. 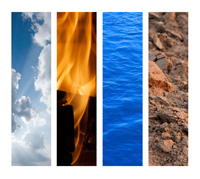 Why is it important to know your personality type in terms of the four magical elements? Because as magicians and shamans the more we know about ourselves, the better practitioners we become. We can use this knowledge to compensate for our weaknesses, and capitalize on our strengths. If you are still not sure about your personality type in terms of the magical elements, consider downloading and taking our online no-cost test. Have fun learning about yourself magically in terms of the four magical elements. Know thyself! Good post, I would describe myself as "BE" but I also think I have moments of "TALK" After learning more about shamans I would be interested in learning this power as I have always had a close connection with the spirit world. Most people do find a mix of elements in their personalities, but you should find one that is more predominant than the others. Try taking the test in the link above if you haven't already and see what scores you get to help find the main element type you are. Knowing your mix is good too because you can choose your strengths from each to fit a situation. For example, if you use your water (feel) to help you know when to use your air (talk) or just be a supportive listener (earth).